If you were quick on the draw, you might have noticed that I had a couple of totally unfinished posts go up on June 29 and 30. I like to be somewhat organized so when I have a plan in my head, I will schedule out entries, done or not. Apparently, I had grandiose ideas that I had totally forgotten about. When I realized my faux pas, I hastily took them down. I did get one of them somewhat ready to post, just in time for the Fourth. This recipe is another Salad-a-Day recipe inspired by an old Cooking Light spread. I deviated quite a bit from the original recipe, basically because my avocado that was destined for this salad was a bit funky looking after I cut into it. 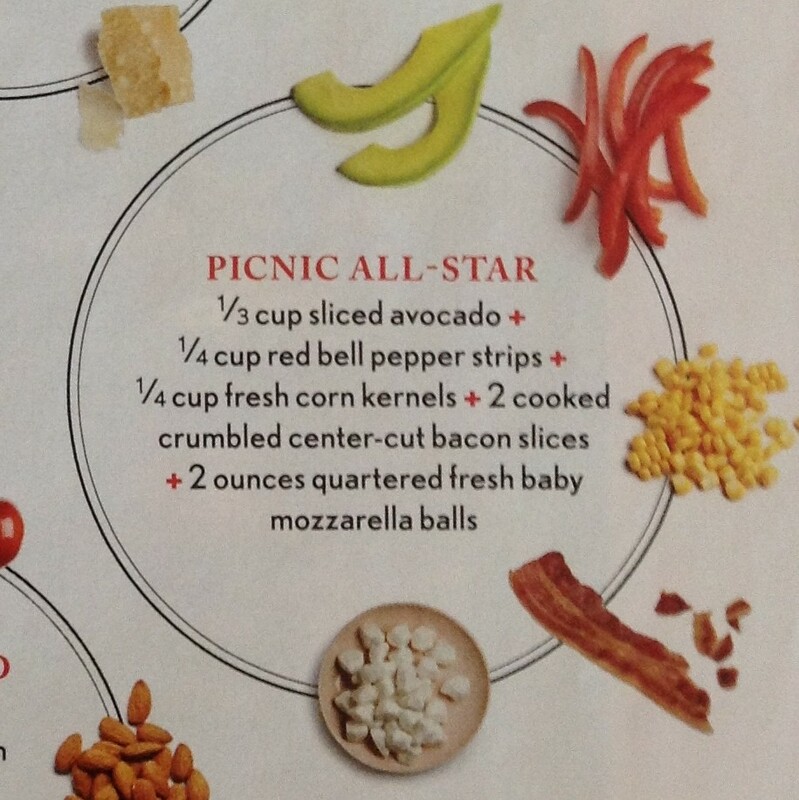 No avocado for this all-star, but I ended up throwing in some other fine ingredients. Don’t skimp on the pepper or the basil in this salad. You can add whatever veggies you like and I was this close to throwing in some diced cucumbers. This salad is perfect for a picnic or Fourth of July cookout because there is no mayonnaise or eggs to cause your guests harm if the fireworks show runs long. I’m linking up to Deb at Kahakai Kitchen for her Souper Sunday HERE. I hope you have a very fire-cracker Fourth of July! I am in the mood for salads too! This one sounds perfect! 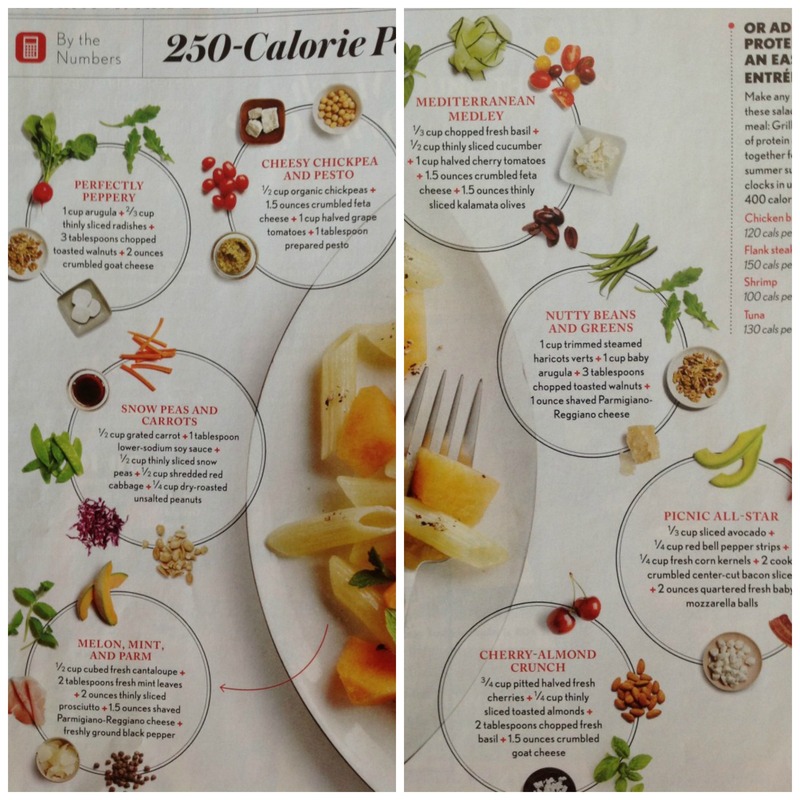 I am so happy you posted this and the photos from Cooking Light. I am on a salad mission. I seriously need to lose a few pounds after vacation and, last but not least, this brutal heat is begging for lighter fare here. Deb’s Souoer Sunday just opened up, you ought to beat me to the punch & linkup before I can post my Cobb Salad! I forgot to ask you, what year was that Cookng Light article. Our library has older copies and I think I’m in love with that one you posted! It will be helpful for my weight loss plan. Let me see if I can research that. The magazine was at my sister’s and I simply took pictures of the article. I’ll be back with you. I’d say you created an all-star. This is the perfect cool side for today and all dog days of summer. Thanks, Adam. Stay cool and enjoy the Fourth! I love a good pasta salad. Have a great Holiday! 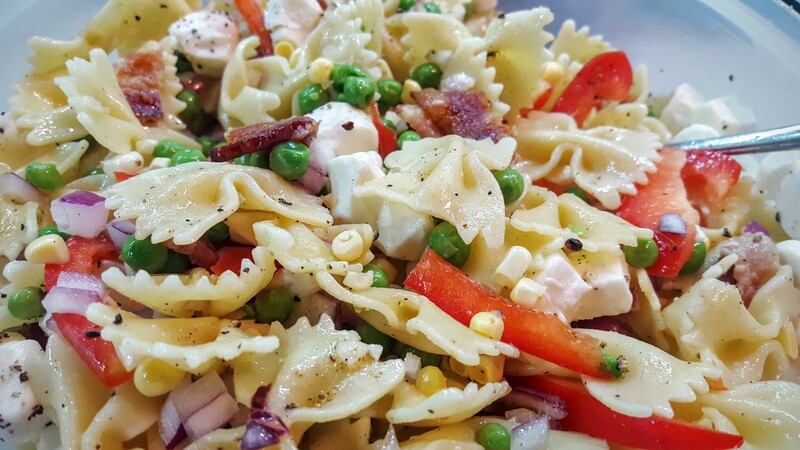 A delicious pasta salad with just 250 calorie… almost too good to be true. Thanks for sharing, Debra. Well, I don’t think my additions added too much to the calorie count. Yum! If I saw this at a picnic I would be the first one to empty the bowl. It’s got everything I love! Bright and full of color and flavor–my favorite kind of salad. 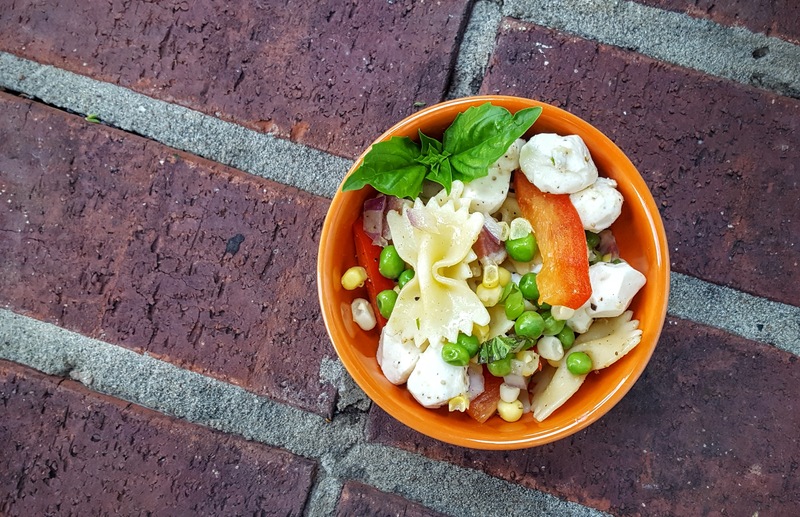 I love the fresh corn in there too–with the fresh basil and other veggies, it screams out summer! The fresh veggies’ flavor really make this salad. Thanks, Deb. YUM! I love everything you put in this pasta salad! Perfect for picnics or my lunches this week 🙂 I do the same thing with my posts—sometimes I check them the night before and find out I have way more work to do on them than I had planned!! I think I think planning them out makes me more organized…I guess they just show my forgetfulness. I love hearty pasta salads like this during the hot months! Filling enough without being too much. Love the bacon — rarely use that in pasta salads for some reason. Good stuff — thanks. You can never overuse bacon. YUM!!!! I love this salad!! And it’s got peas and Bacon!!! I’m sold! Bacon – on salad – of course! YUM!! I’m far behind in my reading but since I really do enjoy reading blog posts and seeing new recipes, I save it up till I have an evening and then I sit back and read. You were up first and it didn’t disappoint!